Matt Dunham – WPA Pool/Getty ImagesPrime Minister David Cameron delivers a speech on immigration at the Home Office, on May 21, 2015 in London, England. Despite pledging in 2010 to reduce migration numbers to less than 100,000, new immigration figures reveal that net migration to the UK reached 318,000 last year, the highest in a decade, increasing more than 50% in 2014. 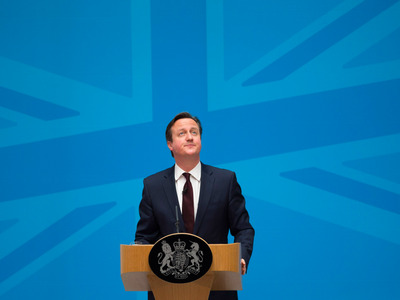 The Prime Minister has today unveiled measures to tackle illegal immigration, which include seizing wages. The pound could jump by as much as 6% against the dollar and UK Independence Party leader Nigel Farage could resign Friday if Britain votes to remain in the European Union in Thursday’s referendum. With just one day until Britons vote, the polls appear to be moving in favour of the Remain camp. Remain has a 7-point lead over the rival Leave camp, according to a poll for The Telegraph. Remain leads Leave by 53% to 46%, with 2% saying they don’t know. The poll was carried out by ORB International and had a survey size of 800 people who all said they would definitely vote. A poll for the Mail on Sunday by Survation gave the In campaign 45% of the vote against 42% for Out. So far, more attention has been given to apocalyptic market scenarios in the event of a Brexit than what would happen if the UK votes to stay in the EU. Some of the forecasts have been grim. This week HSBC estimated the pound could fall by 15% against the dollar and that gross-domestic-product growth will be 1% to 1.5% lower in 2017 than it would have been otherwise if Britain voted to leave the EU. The pound will likely get a bump against the dollar, as future uncertainty clears. “Should a remain outcome be confirmed, the market will immediately begin to focus on underlying indicators and in this scenario we can envisage sterling reaching $1.56 within a year,” Bill O’Neill at UBS Wealth Management said. Stocks are set to rise rapidly on a Remain vote, with Barclays and Ryanair the big winners in the UK, according to research by Macquarie, while Morgan Stanley has said that EU indexes would rally even harder. Yields on bonds will rise sharply as investors dump safe government debt assets for riskier shares, according to a note from Deutsche Bank published on Tuesday. Further down the line, that could translate to higher central bank rates. With no EU referendum to worry about roiling financial markets, central bankers can focus more fully on stopping inflation. The Bank of England’s inflation report on August will be an important moment, according to Bill O’Neill at UBS: “It will be a pivotal point in the direction of policy for the last months of the year,” he said. Leadership challenges on the right-wing would come to a head. Bookies at Ladbrokes have now chalked up Nigel Farage at 8/11 to have left his position with the Eurosceptic party within a few days of the EU Referendum outcome. A victory for Remain wouldn’t necessarily halt the momentum of nationalist parties across Europe. According to CLSA’s “Greed and Fear” research note, a narrow victory could still empower right-wing movements on the continent and “it would take a 10-point-plus majority for the “ins” for the referendum to become neutral for Eurozone separatists,” according to CLSA’s Greed and Fear research note.